Just as every visitor is different, each of my tours are tailored specifically to meet your needs and wishes. In addition to visiting the traditional sites, you’ll have the opportunity to learn about the different cultures, colors, and aromas that create the excitement of Israel. Completing this total sensory experience, my love of this land is passed to you through its songs, every place with a relevant song. Most of my tours are private car tours. Certified Tour Guide by the Ministry of Tourism since 1999 for English & Spanish languages. Bachelor of Arts (B.A.) in Geography & Israel Regional Studies from the Haifa University. Teacher Certified in Geography by the Hebrew University of Jerusalem .Qualifications Specialized in: Pilgrimage – Jewish & Christians, Professionals Meetings & Tours, Hiking Tours and School Groups. 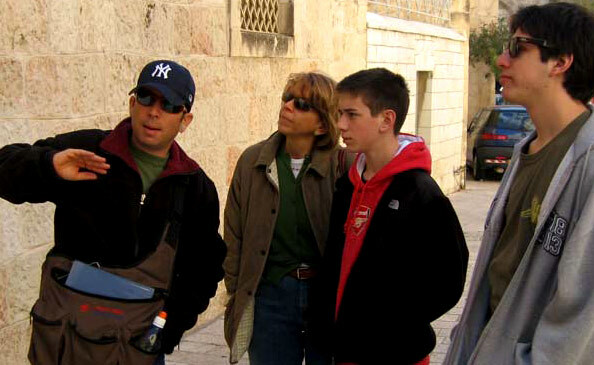 Experience I gained significant experience in the Tourism Industry, not only as an official Tour Guide but as a Guides Coordinator as well at one of the biggest tour companies in Israel, where I planned and operated numerous and varied tours, with no less than 50 tour guides working for me daily. For 3 years I was a part time teacher at a local High School, teaching a special program in Israeli Studies. Nowadays I am a full time Tour Guide working closely with different kinds of groups.